There’s quite a few different types of drill available in your local DIY store but for making larger holes you need a more specialist tool. These are large sized drills with a smaller shank (typically 13mm). 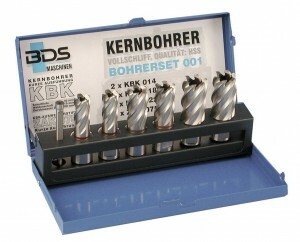 They are great for the home workshop as they will typically fit into a standard drill chuck. Take it easy with them as they cut a lot of metal on each revolution. Also be aware that they are quite long and as I did you might have a problem fitting the bit into the drill. 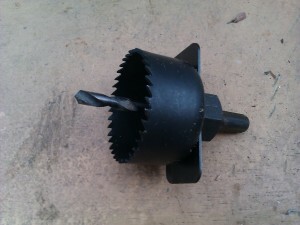 Hole saws typically come in a kit of several different sizes. A central shaft clamps the whole thing together and holds a pilot drill to guide the saw. The tooth pitch on hole saws is usually a little coarse for drilling metal but you can purchase finner pitched saws which are often used for tube notching. Hole saws are often designed for use in masonry and you can get very large core drills up to a metre in diameter. 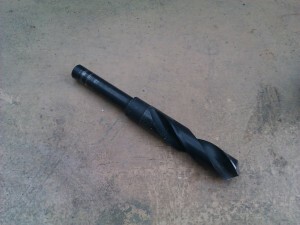 I’ve recently spotted these on the web, they are a drill that uses insert tooling on the tip. They come in sizes up to about 60mm but also have large diameter shanks, typically just 5mm to 10mm less than the drill size. The initial drill purchase price is high. However, if you needed to drill a very large number of holes then the inserts would soon prove their worth especially as each insert has multiple cutting faces. 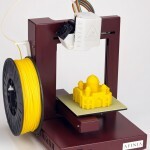 As with other insert tools, savings can be made on not having to sharpen the cutters. These are typically used with magnetic drills when working with steel beams in the construction industry. Rather than remove all the metal in the hole they carve an annular hole pushing out a small disk in the middle and hence are often called annular cutters. A pilot pin locates on a centre dot for accuracy and as you drill is pushed inside the cutter holder compressing a spring. When the drill breaks through the pin is released ejecting the slug of metal from the cutter. 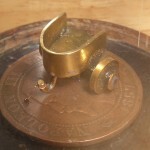 The pin also has a flat or groove on it which allows cutting fluid to flow down through the cutter to the work surface. Many thanks to Bob Johnson of Magdrill UK Ltd for providing the pictures of these magnetic drill bits and clarification on the purpose of the pilot pin. If you want an even bigger hole then you might use a jigsaw for thin sheet or a plasma cutter for thicker materials. 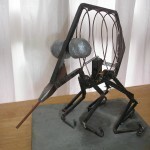 It’s not easy making a round hole with a plasma cutter but I once watched welder Laura Downie make it look easy in an episode of scrapheap challenge. And finally, a link to a page about Post Drills these a drills attach to a post or wall and possibly were the inspiration for the Mag Drill? Just a note about u-drills, you can cut 0.5mm under size & about 1.0-1.5mm oversize on a lathe. Think of it as being a boring bar with a centre insert. Jim, are you saying that the insert position is adjustable, in which case how is it calibrated? Or is it just that you can use different sized inserts? The inserts are not adjustable, the cutting diameter can be changed by using the drill off-centre. Sandvik show the radial adjustment and max diameter in their u-drill information. You can buy adaptors for spindle machines to offset these types of drills but they cost! On a lathe with the Sandvik design you would move the u-drill towards you to produce a larger diameter. 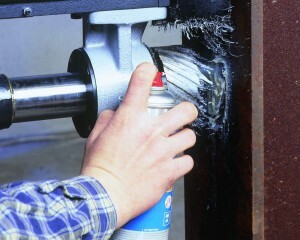 Some manufactures have the outside insert the opposite side off the drill in which case you would move it away from you. Yes,it’s different depending on the size of hole you need.It will be easy and fast work if you have the right sets of equipments. My dad is a construction worker and he knows more of it. 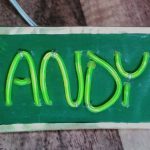 Hey Andy, I read the post entirely and couldn’t help thanking you for sharing with us this piece of the informative resource. Could you please explain the drill bit a little more, so I can enhance the knowledge base of our community website. Of course, you can do it in another post! Any effort appreciated! Cheers Carlos, I am thinking of writing a companion book to “A Little Saw” that looks at making holes so it can definitely build on the details in this post.